But have you noticed that simply holding a pencil encourages nearly everyone to doodle? Why not make it a game? 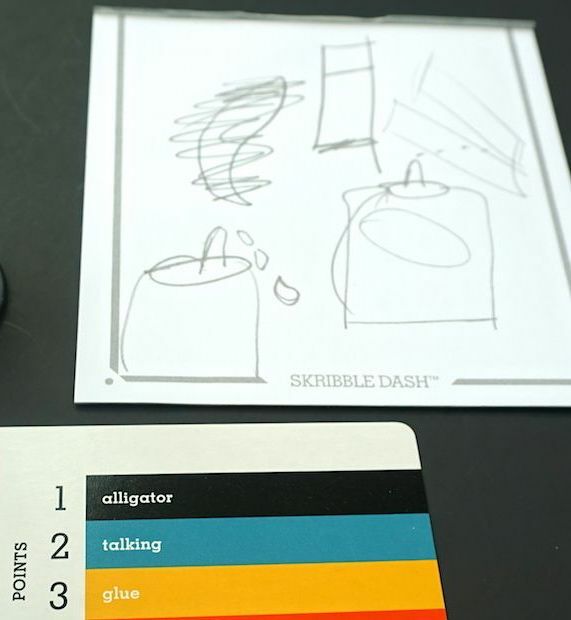 Skribble Dash is a modern entry to the “competitive drawing” genre. Pictionary was the first to tap into the desire to make drawing a recognizable picture into a competition. 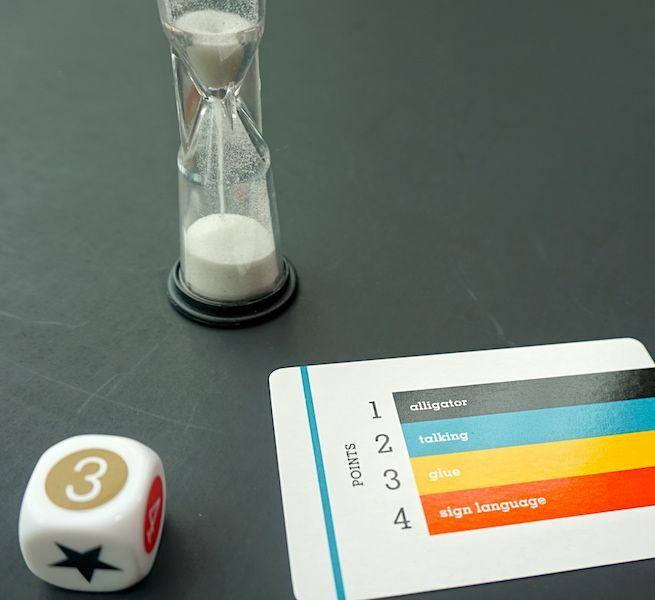 But Pictionary has some major problems: the vocabulary is often at a high level, the gameboard is long and restrictive, and players need to be split into equal teams. All of these make the game too difficult for casual family play. Skribble Dash aims to fix all these problems. As part of the “Ten Dollar Game Night” series from Haywire Group, it presents an inexpensive, quick alternative that the whole family will enjoy. One person (the “Skribbler”) picks a card from the deck and rolls the die. They must then draw the corresponding word or phrase on the card, in just 60 seconds. Could you guess this picture? 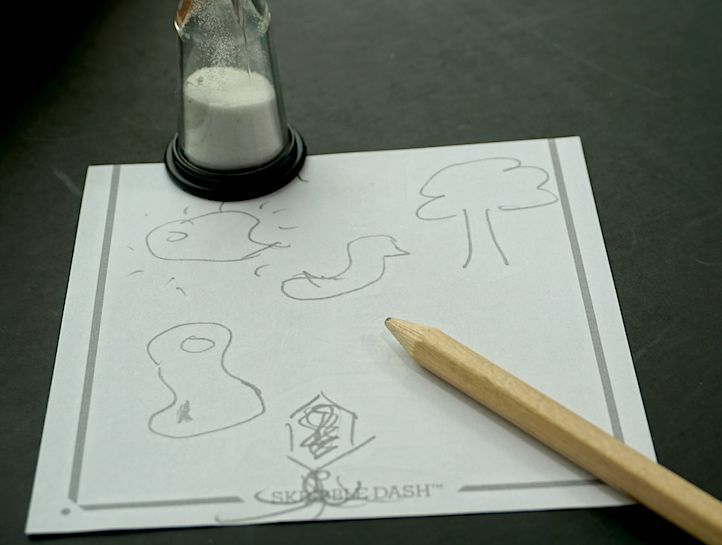 Once the Skribbler starts drawing, the rest of the players can begin to guess what is being drawn. If someone guesses correctly before the time runs out, points are awarded. 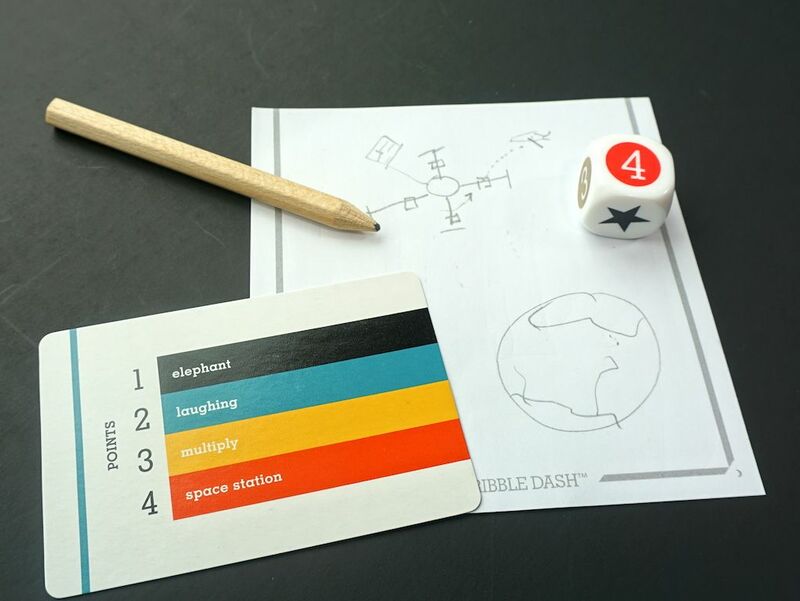 The guesser earns the point value listed on the card (1 for the easiest words, 4 for the hardest), and the Skribbler earns the point value plus 2! “Space Station” seems clear. Or is it? The rules say to play to 25 points, but we’ve more often played this as a filler game with a limited amount of time. The player with the most points wins. Skribble Dash is both fun and challenging. Unlike some other guessing games, it keeps all the players involved every round. The words are well chosen for a wide age gap. There were a handful that tripped up our 7-year-old, but most were easily understandable. On the other hand, how do you draw “yellow”? Or “organism”? There’s not a whole lot here, but that’s because Skribble Dash is part of Haywire Group’s “Ten Dollar Game Night” series. For less than $10, it’s a great value, and everything you need is included in the box. (As of this writing, it’s only $6 on Amazon!) We think it’s a perfect restaurant game. Bring it the next time you know you’ll have to wait, and pass the minutes with sketching, guessing, and laughing. 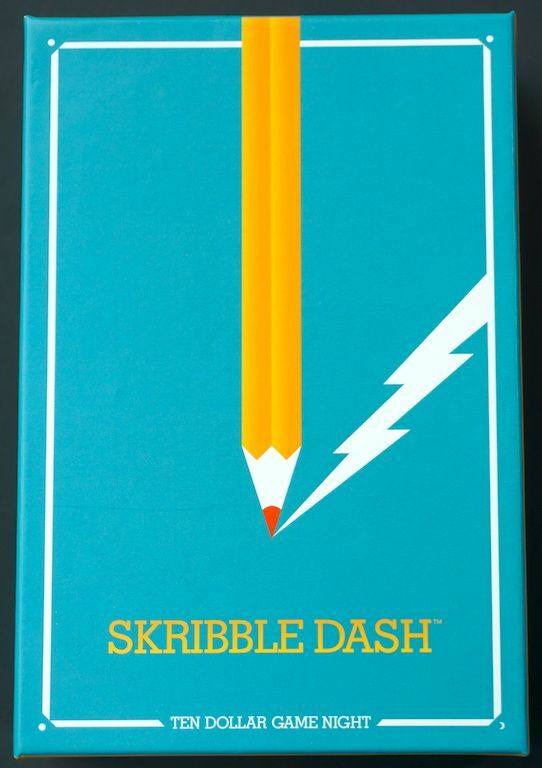 The Family Gamers received a review copy of Skribble Dash from Haywire Group.